Need to find a pet friendly hotel in Fairbanks? Click the Pet Friendly Accommodations Button below!" 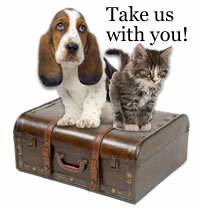 It's easy to find pet friendly hotels in Fairbanks on PetTravel.com. Just click the SEARCH button above for a list of pet friendly hotels, motels, bed and breakfasts, small inns, and vacation rentals in Fairbanks. If there is information for other pet friendly services in Fairbanks, a second search button will appear that will include pet friendly beaches, parks, and other fun things to do with a pet. Emails are welcome regarding pet friendly services in any town. Just send an email to info@PetTravel.com. Come back often as there are always new and exciting places to visit with a pet on PetTravel.com. There are also pet sitters in selected cities who will "petsit" a pet while visiting in Fairbanks.